Is Duke Energy following its home state's turn to the right? Jim Rogers is burnishing his reputation as an influential former utility executive willing to prod the industry to tackle climate change and embrace a cleaner, smarter grid. But he admits his calls to action -- and his legacy following a seven-year run as CEO of the politically powerful Duke Energy Corp. -- are on shaky ground in North Carolina, where a conservative takeover is complicating green policymaking and climate action. Making matters worse, his hand-picked successor at Duke is facing scrutiny over a massive coal ash spill and efforts to slash payments to homes and businesses generating solar energy, among other controversies. "Legislation that fundamentally changes how utilities are regulated requires building a consensus among Republicans and Democrats and all the various stakeholders engaged with utilities," Rogers said during a recent phone interview from his office in Charlotte. "It requires being open to the possibility that climate change is a reality, and I don't think the Republicans in North Carolina believe it's a reality, a possibility even." E&E examines a state in political turmoil. The primary factor in modernizing utilities, he added, is "regulators that are ready to change and believe we need to change, then you need the legislature -- and I don't really see that happening in North Carolina. North Carolina will be a follower, not a leader." In addition to being a rare CEO openly preparing for climate change, Rogers is a well-known Obama supporter who brought the Democratic National Convention to Charlotte in 2012 -- a move that Rogers said was not politically motivated but instead aimed at boosting Charlotte's prominence on the world stage. But these days, Duke's formidable lobbying presence is tilting with North Carolina to the right -- and funding the same politicians whom Rogers blames for blocking climate action. "They have shifted their giving to more dominant Republicans on the state level, to the state Legislature and to the party committees that support General Assembly races. They have tilted now strongly to Republicans," said Bob Hall, executive director of Democracy North Carolina, a liberal government watchdog. "They're giving to incumbents disproportionately, that's typically what they've done for years of whatever party." In the latest election cycle, Duke spent more on conservative causes than in previous years. The company's top recipient of campaign contributions was the National Republican Senatorial Committee, which received $32,400 from individuals employed by Duke and $30,000 from Duke's political action committee, according to the Center for Responsive Politics. Current Duke CEO Lynn Good, who declined a request for an interview, alone has donated $9,250 to Republican congressional and presidential candidates and $1,500 to now-retired Democratic Sen. Byron Dorgan of North Dakota since 2005, according to a review of Federal Election Commission records. Rogers, on the other hand, gave generously to Democrats in one of their most pivotal beachheads against a GOP Senate takeover in November. Rogers and his wife donated more than $10,000 in 2013 to incumbent Sen. Kay Hagan (D-N.C.) to aid her tough re-election campaign against state House Speaker Thom Tillis (R), according to the Center for Responsive Politics. Further complicating the post-Rogers transition is the reality of coal ash -- not clean energy -- leaping to the top of the Tar Heel State's agenda this year. Duke's new CEO is playing defense after a 48-inch stormwater pipe broke in February under a Duke coal ash slurry dump in Eden, N.C., spilling 30,000 tons of waste into the Dan River. "The coal ash spill is still a big political event, a dominant political story, toxic for Duke," said Carter Wrenn, a veteran Raleigh-based GOP strategist who noted that many lawmakers are "gun shy" about being on Duke's side. "The lobbyists are now in the position where there's public opinion pushing against them, where it wasn't before." 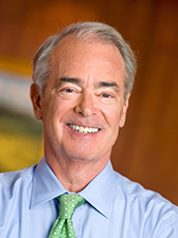 Jim Rogers is now retired after a seven-year run as Duke Energy’s CEO. Today, Rogers is calling the utility industry to embrace a cleaner, greener and more flexible future. Photo courtesy of Duke Energy. Jim Warren, executive director of the advocacy group NC WARN, said he sympathizes with Rogers' push for a greener future but adds that North Carolina, where Duke is still dominated by fossil fuels, has little to show for his efforts. Duke is currently 41 percent coal, 33 percent nuclear, 24 percent gas, and 2 percent hydropower and solar energy. To be sure, Duke -- an energy behemoth made up of five utilities operating in the Carolinas, the Midwest and Florida -- has invested more than $3 billion since 2007 in its unregulated business to foster renewables and is seen as a key vehicle for solar development in the Tar Heel State while meeting North Carolina's renewables energy standard. Duke is also investing in efficiency and has hydroelectric plants producing more than 3,000 megawatts of power each year, not to mention renewable energy credits from out of state. "My best read is that [Rogers] may have believed a lot of what he said about going green, but he couldn't turn the Duke ship. That's the narrative I choose to believe," Warren said. "Part of the tragedy is that in his home state, they haven't performed, they've done a massive 'greenwash' of their corporate image and pretended to support renewables without matching that with their current deeds in the present era, nor in their long-range" integrated resource plans. Kelly Martin, a senior campaign representative for Sierra Club's Beyond Coal campaign in North Carolina, agreed there hasn't been much change in the corporate vision. "Jim Rogers was clearly a very charismatic leader with a very different public style -- he was well-versed in climate and clean energy issues," Martin said. "But at the end of the day, he and Good are both leaders of a company that's leaving behind a legacy of toxic coal ash, that's reliant on fossil fuels, and dragging its feet on renewable energy and efficiency." Rogers, 66, isn't shy about touting his accomplishments pushing for clean energy -- or the key role he played in grooming Good, a former accountant and utility auditor whom he's known for decades, to be Duke's first female chief executive. He steps more carefully, however, when it comes to grading Good or her approach to renewables. Last year, Lynn Good took the helm of Duke Energy, the country’s largest utility, and has since been tackling the North Carolina coal ash spill and ongoing debates over net metering. Photo courtesy of Duke Energy. Rogers' resume includes the launch of Duke Energy Renewables; the shuttering of several old, dirty coal plants; and vocal support for federal climate legislation as far back as 2007. Today, Duke's renewable business is growing, including an announcement this month that the utility will build the largest solar project east of the Mississippi. Rogers said he had an eye on Good -- and diversity -- near the end of his seven-year run as Duke's leader. "When I stepped down, I had six executive vice presidents reporting to me, and three were women. So one of my missions was also to develop a little diversity," Rogers said. "If you think about the world today, more than 50 percent of the people graduating from college, law school, medical school, getting MBAs are women -- so the role of women in the future is going to be far different than it's been in the past." "You have to admit, the utility industry is a pretty white male [dominated industry]," he said. Good, 55, joined Cinergy Corp. in Cincinnati in 2003 after working as a partner for the accounting firm Deloitte & Touche and holding various senior management roles at Arthur Andersen. She started at Cinergy as vice president of financial project strategy and was named vice president and controller later the same year, and vice president of finance and controller in January 2005. Rogers said he boosted Good by moving her over to run Duke's commercial businesses, including 6,600 MW in the Midwest, operations abroad and the commercial renewables arm, where she served from 2007 to 2009. When the opportunity presented itself, Rogers said, he promoted her into the role of chief financial officer in the summer of 2009. "She was very talented, she knew how to tell me no," Rogers said. "I do listen to people but she had the ability to say no in a way you got 'I understand why you're telling me no.'" 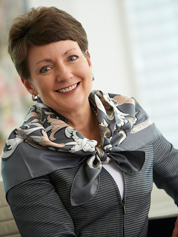 Good became Duke's president, CEO and vice chairwoman of the company's board of directors last summer. Before that, she served as the company's executive vice president and chief financial officer, led the controller's office, treasury, tax, risk management and insurance, as well as corporate strategy and development. She was also responsible for the information technology and supply chain functions. Ultimately, Rogers said, it was Duke's decision for Good to lead. "At the end of the day, I didn't select her, the board selected her," he said. Still, one industry watcher said "the jury is still out" on how Good will lead the company. "She had to deal with the coal [spill] right out the chute, it'll be a while before she defines her legacy," the source said. "She also needs to come out from Rogers' shadow." In addition to the ongoing spill crisis in North Carolina, Good is facing a lesser controversy over Duke's approach to net metering and rooftop solar in North Carolina. In January, Good told reporters at a briefing that Duke would attempt to reduce "how much North Carolina households are paid for generating electricity from solar panels." In response, solar advocates like the Alliance for Solar Choice (TASC) have launched a campaign accusing the company, reportedly a member of the American Legislative Exchange Council, of trying to kill rooftop solar to protect its monopoly, one dominated by coal- and gas-fired generation. TASC has called on Rogers to step in and advise Good, who the group says "lacks" the former CEO's "vision" on renewables. Greg Andeck, a senior clean energy manager in the Environmental Defense Fund's North Carolina regional office, said existing utility laws in the state bar competition and have stymied North Carolina's growth in solar. Andeck also said Duke's efforts to change net metering prices are making matters worse by injecting uncertainty into the market. Duke spokesman Randy Wheeless said the company currently has 1,700 solar customers in North Carolina -- out of 3 million total -- including small businesses and homes that use net metering for rooftop solar systems. Duke is primarily concerned about a pricing rule that allows owners of rooftop solar systems to sell surplus electricity they generate to Duke at 10 cents per kilowatt-hour. The utility has floated the idea of paying customers only the generating costs, between 5 and 7 cents -- and is crafting recommendations to float with state regulators by the year's end, Wheeless said. "It seems a little odd that we're paying so much more for rooftop solar than any other type of solar," Wheeless said. "It's growing, I can't put a percentage or figure on it. But that's one reason we've been voicing this opinion, to get net metering rules correct now, as opposed to five years from now when we have 10,000 customer who have [net metering]." For his part, Rogers is careful to tread lightly about his new successor. "I think in the long term, they understand distributed generation will play a role," Rogers said. "I think Duke understands that their role is going to change but the regulatory and business model have to change." Looking forward, Rogers said North Carolina needs to take climate change seriously; maintain its renewable portfolio standard; and embrace new technologies like storage, renewables and distributed generation. "When you see technologies evolving that challenge your business model, you need to embrace them. You don't want the utility industry to have a Kodak moment," Rogers said. "You know, Kodak developed digital, but they couldn't move away from their traditional way because it was their core business. The utility industry should embrace distributed generation, they actually should invest in distributed generation and be a competitor with everyone else." The message revolves around Rogers' view that almost every U.S. power plant -- other than hydro -- will be retired and replaced by 2050, leaving the country with "a blank sheet of paper" to work on. Planning gives the United States a chance to address climate change and design a more sustainable system, he said. He warns that demand for electricity may be modest -- and that utilities may no longer be suppliers if they don't find a way to participate in building and operating distributed generation in the United States. In addition to messaging, Rogers is busy writing a book about bringing electricity to 1.2 billion people in developing countries and collaborating with the Brookings Institution on workshops to discuss trends in the utility industry. He's also become a familiar face at utility and clean tech conferences, downplaying the doomsday projections about U.S. EPA's carbon rules and "spiral of death" associated with a distributed grid. Industry watchers in North Carolina say Rogers' comments shed an interesting light on looming debates. EDF's Andeck pointed to a 1960s-era law in North Carolina that bars electric competition in Duke's territory. He also pointed to a portion of North Carolina's General Statute, which he said hampers solar companies from entering into no-upfront-cost contracts and selling power to homeowners and businesses. "What's challenging in North Carolina compared to other states that allow competition is that we're losing out on being able to attract clean energy companies to our state because of these old laws," Andeck said, citing the success stories of Solar City, which now operates in 13 states and has added thousands of new employees since 2007. Debates around net metering, competition, tax credits and other energy policies are likely to heat up in the North Carolina General Assembly's regular session next year, Andeck said. "It really is the question of what type of electricity infrastructure do we want to have, one dominated by one large utility or one in which customers have a wide range of choices for meeting their needs," he said. Rogers is calling on policymakers to craft adaption plans to fight warming in North Carolina and nationwide. "How do we adapt to the droughts in the Southwest and the Colorado River? How do we address adaptation problems associated with receding shorelines in Florida? Or storms along the Atlantic?" Rogers asked. "I've come to believe that there's already been enough warming to create adaptation issues, and that my thought about turning to adaptation is not about ignoring mitigation, but the clear recognition that we're at a place where adaptation strategies are needed." But again, Rogers acknowledges that change requires political will and finding common ground. And he doesn't see that in North Carolina. He pointed to a GOP measure to scale back the state's renewable portfolio standard introduced by state Rep. Mike Hager (R), a former Duke engineer. "I think we need to maintain renewable portfolio standards until the prices" of new technologies fall further, Rogers said. "I supported the passage of the RPS. And I see no reason at this juncture to change it. Five years from now, maybe. Ten years from now, maybe. But not now." Although some green groups have questioned Rogers' legacy, Andeck said it's refreshing to hear an industry voice emphasize the need for a clean path forward. "What's exciting to hear are the voices of people that have been in the industry, like Rogers, that we can't continue with the status quo if we're going to enable clean energy businesses to succeed in the 21st century," he said.